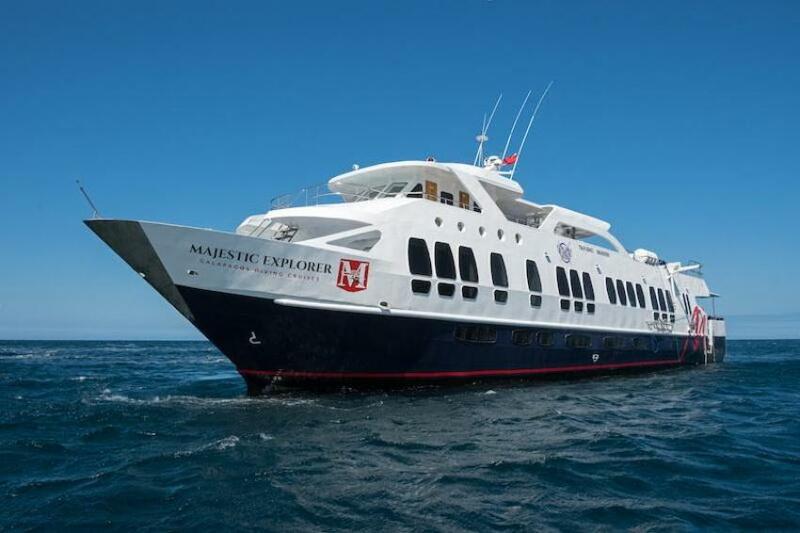 Majestic Explorer - spacious modern boat, offers diving trips to Galapagos Islands. Boat feature special facilities for photographers. Add to his cozy lounge areas with jacuzzi and you will get the perfect liveaboard for your vacation. 8 cabins aboard of Majestic Explorer can accommodate 16 passengers. All have individual bathrooms, air conditioning, and ample storage. 4 staterooms are on the lower deck. All have twin beds. 2 of the upper deck cabins have double beds and the other room with twin beds. Some cabins have convertible beds that suit either for double occupancy and for twin share. Majestic Explorer features a spacious lounge area with TV and a bar. There is also a sun deck with a jacuzzi. Big boat’s dive deck supplied with shower and storage boxes. There is a special working area for photographers. Majestic Explorer has all necessary safety and navigation facilities aboard, including sounder, GPS, radio, emergency rafts, life vests, oxygen, first aid kits. Majestic Explorer is perfect for photo trips. There so many things on Galapagos that you might want to capture. Especially when boat offers special photography station where you can maintain your cameras, rinsing cameras and storage. Majestic Explorer's trips include diving on Darwin and Wolf Islands. This destination is great for shark lovers. You can meet Galapagos sharks, hammerheads, silky sharks, huge whale sharks. Also, they feature eagle rays, tuna, sea lions. Remoted from the mainland Galapagos Islands preserved lots of endemic creatures. Diving season on Galapagos Islands can be divided into two parts. The wet season lasts from January to June. Water temperature fluctuating between 68 to 77°F (20-28°C). The dry season begins in July and ends in December. Temperature is much cooler at this time. Usually between 66 to 73°F (19-23°C). Best time to dive with whale sharks from June to November. However, a warmer season can be much more pleasant for vacation. And it’s also great for manta encounters and hammerheads.